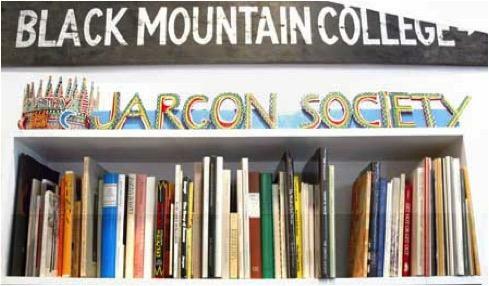 The Black Mountain College Museum + Arts Center is honored to announce that the Jargon Society, the highly significant small-press publisher founded in 1951 by Jonathan Williams (Asheville native, Black Mountain College alumnus, poet, publisher and photographer) is now under the museum’s auspices. The Jargon Society was founded by Jonathan Williams and David Ruff in 1951 in a San Francisco Chinese restaurant. Jargon 1 was a folded pamphlet with a poem by Williams (“Garbage Litters the Iron Face of the Sun’s Child”) and an etching by Ruff. Just 150 copies were produced. Jargon 2 was called The Dancer and consisted of a poem by Joel Oppenheimer and a drawing by Robert Rauschenberg. It was published at Black Mountain College soon after Williams’ arrival there in the summer of 1951. Other Jargon publications included The Maximus Poems by Charles Olson, The Neugents by David M. Spear and many others. Williams died in 2008 and is survived by his partner Thomas Meyer. It was Meyer who made the decision to give The Jargon Society inventory and rights to the Black Mountain College Museum + Arts Center. Jonathan Williams’ publishing philosophy was to seek out writers, poets and photographers who pursued a singular path in their work and were under-recognized, outside of the mainstream, but deeply deserving of attention. Jargon books and publications were always beautifully designed and printed, expressing Williams’ unique aesthetic sensibility. He often paired artists, photographers and writers in a way previously unseen. There are 115 Jargon Society titles in the original series. A number of these are rare, valuable and highly sought after by collectors. Of the 115 original titles in the Jargon catalogue, approximately 85 are books and another 30 are broadsides, pamphlets and other publications. Jonathan Williams provided early appreciation and an important publication outlet for now-celebrated writers such as Charles Olson, Robert Creeley, Denise Levertov, Robert Duncan, Mina Loy, Lorraine Niedecker, Kenneth Patchen and many others. One of Jargon’s most noteworthy titles was the publishing phenomenon White Trash Cooking by Ernest Matthew Mickler. By 2011 celebrating its 25th year in print with a special edition, White Trash Cooking has received rave reviews by a diverse roster of fans including the governor of North Carolina, the New York Times Book Review, cookbook authors and actress Helen Hayes. It continues to be Jargon's top-selling title even now. As a publisher, Williams’ goal was to give the artist and/or the poet “the book that they wanted” if it was at all possible. This approach, while unusual in the publishing world, was consistent with William’s belief in democracy and consistent with a philosophy that championed the underdog. Thomas Meyer, Williams’ partner, worked with him on Jargon projects for many years and has several books of his own poetry published under the Jargon imprint. Additionally, Meyer's work as a poet and translator has been widely published and acknowledged for its precision and depth of feeling. Future Jargon/Black Mountain College Museum + Arts Center projects have yet to be identified, but the possibilities are exciting to contemplate. For more information please contact Alice Sebrell, Program Director, at 828-350-8484.